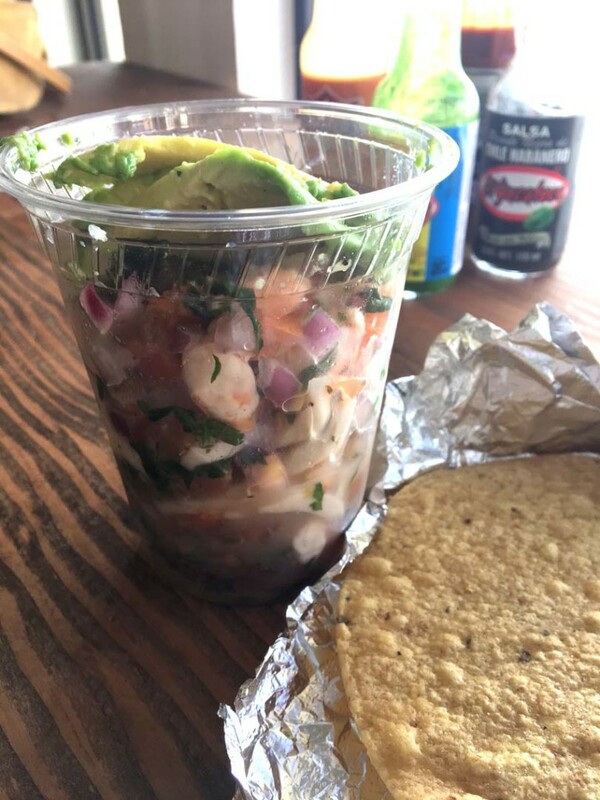 If there is such a thing as a perfect lunch meal in a cup, the ceviche at Oscar’s is pretty darn close. Ceviche is right up there with a poke bowl as one of my go-to healthy lunches that satisfies yet does not induce a nap craving food coma. I was only recently made aware, after running out of new preparations for an ample supply of Thrasher shark and exploring recipes, that the fish in ceviche is “cooked” by the acid in citrus juices, mainly lemons and limes yet oranges are often thrown in the mix as well. Add some onions, salt, cilantro and avocado and maybe some corn and you are good to go. I found this process fascinating and a quick, easy and delicious way to whip up a healthy seafood snack. Ceviche is popular in the coastal regions of Peru, Mexico, Central America, Ecuador, Columbia and many other parts of Latin America. Some archaeological records suggest consumption of similar preparations going way back nearly 2,000 years. My introduction to Oscar’s came a few years back when Lick the Plate was on KPRI and morning show host Chris Cantore requested we meet at their Hillcrest location to record our interview. After observing the bustling lunch crowd and sampling their delicious offerings I was sold on their concept of fresh Mexican seafood and hoping for a North County location. That wish came true recently when this family-run operation that started in Pacific Beach opened their fifth location in Encinitas discreetly tucked in next to the Trader Joe’s. As of this writing, they did not have a sign out front yet so my advice is to park where you can and walk towards Pete’s Coffee, turn left and you will find it. Let’s get back to the fabulous ceviche at Oscar’s. They offer four varieties, fish, shrimp, mixed, and yellow fin tuna. The first three options are $5.25 and the yellow fin is $8.75. It’s an ample portion served with avocado and two crunchy tostadas on the side. This is a great value and you will be surprised how much they fit into that cup. We also tried the fish stew which is more like a fish soup but delicious whatever you want to call it. The small is only $1.99 and is a great way to sample it and a perfect side or starter to your meal. They also offer a larger version for $7.99. I’d also heard raves about the smoked fish at Oscar’s so gave that a try in taco form and that was another winner. We combined that with the skirt steak taco that was tender and delicious as well. I should note that we also discovered a new favorite beverage to go with Mexican food called Batch Craft Soda that they had in fountain form and offered free refills. I went with the Root Beer and it was as good as I’ve had. I will be exploring all the flavor options from this Orange County based company very soon. They also offer fresh fruit water, Jarritos Mexican soda and of course Mexican Coke. I will be back very soon to explore the rest of the menu at Oscar’s, as there is a lot more to try. They have three breakfast options including a burrito, torta, and plate served with eggs, cheese, potatoes and avocado. Then pick your protein of smoked fish, bacon, ham, steak, or chorizo. Las Botanas loosely translates into appetizers or platters and Oscar’s offers cucarachas (15 fried shrimp with shell on) covered in a blend of spicy salsas and fresh limejuice for $10.99. There is also a garden seafood salad with your choice of fresh grilled fish, shrimp or octopus upon availability and its market priced based on the seafood. There is also a grilled fish option in salad, taco, flour tortilla, torta or plate and again this is market priced. Tortas come with smoked fish, spicy shrimp, or skirt steak or the fisherman’s torta with a seafood mix in between the torta bread. The sides include the previously mentioned fish stew, quesadilla, bean and cheese on flour tortilla, pinto beans and rice. Tacos include seven seafood and meat options and I’ve heard that the battered fish tacos are right up there with San Diego’s best. The bottom line is that in an area already crowded with taco joints, Oscar’s has a style all it’s own that is worth exploring and adding to your list of options when fresh Mexican with a seafood emphasis is what you are craving. Oscar’s Mexican Seafood is located at 115 N. El Camino Real. Call (760) 487-5778 or go online Oscarsmexicanseafood.com.